Alexander Korznikov, an Israeli security researcher, has recently demonstrated that a local privileged user can even hijack the session of any logged-in Windows user who has higher privileges without knowing that user’s password, using built-in command line tools. This trick works on almost all versions of Windows operating system and does not require any special privileges. Korznikov is himself unable to figure out if it is a Windows feature or a security flaw. The issue discovered by Korznikov is not entirely new, as a French security researcher, namely Benjamin Delpy, detailed a similar user session hijacking technique on his blog some six years ago. Korznikov calls the attack a “privilege escalation and session hijacking,” which could allow an attacker to hijack high-privileged users’ session and gain unauthorized access to applications and other sensitive data. 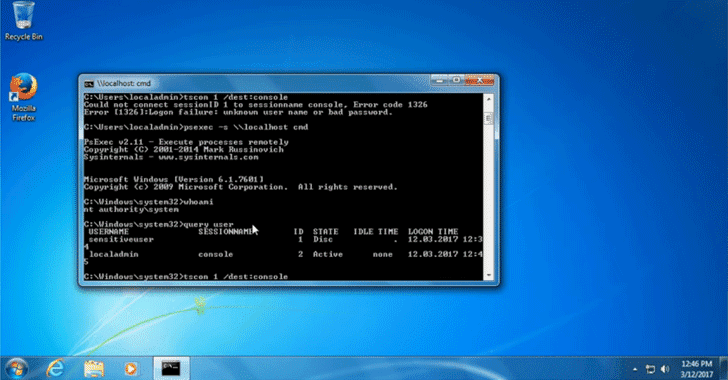 For successful exploitation, an attacker requires physical access to the targeted machine, but using Remote Desktop Protocol (RDP) session on a hacked machine; the attack can be performed remotely as well. Video Demonstrations and PoC Exploit Released! Korznikov has also provided a few video demonstrations of a successful session hijacking (using Task manager, service creation, as well as command line), along with Proof-of-Concept (PoC) exploit. Korznikov successfully tested the flaw on the newest Windows 10, Windows 7, Windows Server 2008 and Windows Server 2012 R2, though another researcher confirmed on Twitter that the flaw works on every Windows version, even if the workstation is locked. Well, no doubt, alternatively an attacker can also dump out system memory to retrieve users’ passwords in plaintext, but this is a long and complicated process compared to just running tscon.exe with a session number without leaving any trace and using any external tool. The issue has been known to Microsoft since last six years, so it’s likely the company doesn’t consider it a security flaw as it requires local admin rights on the computer, and deems this is how its operating system is supposed to behave. Next article Searching for Leaked Celebrity Photos? Don’t Blindly Click that Fappening Link!